Applications to become a Nottingham Advantage Award student representative/ champion for 2019/20 have just opened. If you already know you want to apply then you can find out more here. However, if you still need some convincing then read below about the experience of one of our 2018/19 student representatives – Taapsi Kohli, BA Hons Politics and International Relations, second year. The University of Nottingham consists of over 40,000 students and each of them has an opinion. As a Nottingham Advantage Award student representative I was able to act as the collective voice of the students. There is no one reason to why I wanted to become a representative. I just felt that there were countless benefits of being a part of something bigger. Working with the University community to make a difference. Before I met the Steering Group I felt that – as a student – I might be left on the side lines when discussing important Advantage Award issues. However, during the meetings my opinion was highly valued and my suggestions were discussed. This made me feel part of the larger group of University staff members. I was also given the opportunity to moderate existing Award modules across all three campuses. It was exciting to know that my reviews would actually be able to bring about changes to a module and the way it is taught. The Award team is always on a mission to make the student experience fun and educational, whilst also maintaining a balance between academic work-load and extra-curricular activities. Voicing the expectations of fellow students was fruitful towards my experience as well as those of you who are enrolled in modules. Not only did I contribute to meetings, but also gained more practical experience representing the Award team at Refreshers’ Fair and Open Days. Being confident in yourself is key to making a good impression. It is an essential attribute both professionally and generally in life. My experience talking to different people gave me so much confidence and improved my presenting skills. Throughout the role I was able to network and learn more about different aspects that appeal to individuals. I also had the opportunity to liaise with the Careers and Employability Service – who later helped me structure my experiences onto my CV. The role is very different to the traditional Advantage Award student experience. It is almost like taking a module. However, you choose what to contribute, when to speak up and you are the one moderating instead of being assessed. When reflecting on my journey, it is clear how much I have learnt from the Award team and opportunities given to me. I had the chance to be independent, make contributions and participate in discussions with others. You will learn different things and your experience may be slightly different to mine. But for me, that is what is so wonderful about being a representative. You gain from it what you want. Entering the role you may initially know what you want to get out of it. However, there are so many opportunities that you will be surprised by how much more you can gain. Ready to represent your student community? 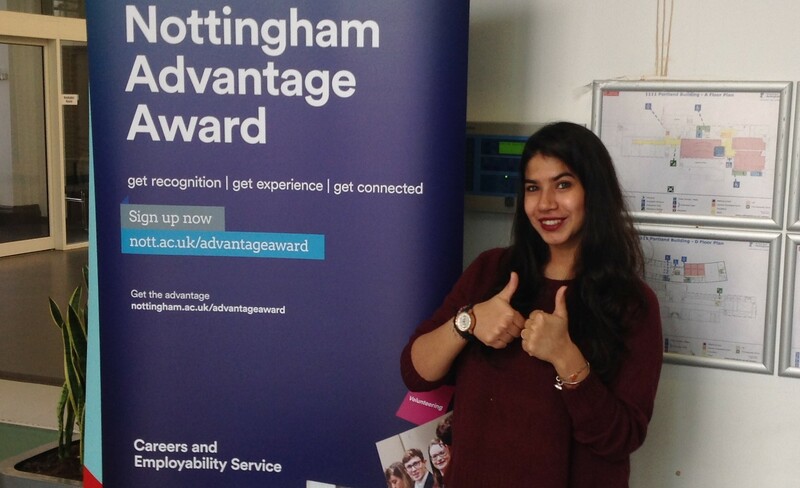 Become a Nottingham Advantage Award student representative and apply here now by Friday 17 May. You can keep up-to-date on the Nottingham Advantage Award via social media, so please like and follow us on Facebook and Twitter. Cate Hogan on Show don’t tell – how the Award can help you!